The blog crashed on me late last night and it wasn't until Saturday afternoon that I was able to repair it so my apologies for a very lengthy post as I try to play catch up on all the action. I just combined the Friday and Saturday report so my apologies for an extremely lengthy post. It would be confusing to try to hand out stars so the report is being done in order of how well his team did. That means that Adam Pelech (NYI 2012 3rd) and Troy Donnay (NYR 2013 UFA) get to lead things off as their Erie Otters after wins on Friday and Saturday night have a 7 game winning streak going. The Erie Otters with the best record in the entire OHL at 9-2-1-0 earned wins over the Belleville Bulls (4-3) and the Ottawa 67's (6-2). Pelech has picked up his game as of late and while it may be just a coincidence but a 7 game scoring streak (2-6-8) while the Otters are on a 7 game winning streak has to be acknowledged. Pelech on Friday against the Belleville Bulls posting a secondary assist while playing a solid game on defense. It wasn't perfect as Pelech took a 3rd period minor for "hooking" that led to Belleville's 2nd goal of the game. On Saturday, Pelech recorded his 2nd goal of the season which was also Erie's 2nd goal of the game in the win over Ottawa. His teammate Troy Donnay recorded a secondary assist on Erie's 3rd goal which was the game winning goal but also played a strong game on defense helping Erie to record 7 kills on the power play. The closest anyone came to earning a star was Taylor Cammarata (NYI 2013 3rd) as he had a 1-3-4 +5 weekend as his 3rd ranked Minnesota Golden Gophers swept the Bemidji State Beavers 6-3 on Friday followed by a 5-1 spanking on Saturday evening. Cammarata recorded his first points as a member of the Golden Gophers on Friday evening when he had a secondary assist on Minnesota's 5th goal then had the only assist on Minnesota's 6th goal an empty net goal. On Saturday, Cammarata made his first NCAA goal an impact goal as it was Minnesota's 2nd goal of the game and turned out to be the game winner in their 5-1 win. Cammarata added another secondary assist on Minnesota's 5th goal of the game. In the video, Cammarata wears number 13 and his goal starts at the 37 second mark. Teammate Jake Bischoff (NYI 2012 7th) recorded his 1st NCAA point in Saturday's game, a secondary assist on Minnesota's 3rd goal of the game. Bischoff was a health scratch for Friday's game, played a pretty good game on Saturday. Brady Skjei (NYR 2012 1st) played in both games and was scoreless but a +1 on 3 shots. Minnesota should move up to 1st in the next college poll thanks to losses to teams with prospects on it. Anthony Duclair (NYR 2013 3rd) had a quiet Friday evening as his Quebec Remparts defeated the Moncton Wildcats 3-0 going scoreless on 2 shots and a minor for "delay of game". Saturday was a different story as Duclair was the game's 1st start after a 1-1-2 5 shot +1 led Quebec to a 5-2 win over the Saint John Sea Dogs. Duclair had the primary assist on Quebec's 4th goal and his goal was the Rempart's 5th goal but it came less than 2 minutes after Saint John had scored to pull within 2 goals. Duclair's goal ended any hope of a comeback as Duclair improves to 9-5-14 on the season. The win gives Quebec a 6th game unbeaten streak as the Remparts improve to 6-5-3-0 on the year. Sophomore center Steven Fogarty (NYR 2011 3rd) and junior defenseman Robbie Russo (NYI 2011 4th) as both were perfect examples of each having good times as well as the not so good times. The good times were that they scored first period goals as part of 4th ranked Notre Dame's win over Michigan Tech 3-2. As you saw on the video, Fogarty scored on the rush to give Notre Dame an early 1-0 lead . It was Fogarty's first of the season as he scored the goal as part of his 4 shots,+1 and a 6-7 on his faceoffs. Fogarty also took a tripping minor just 13 seconds into the game. Notre Dame will play Michigan Tech again on Sunday. 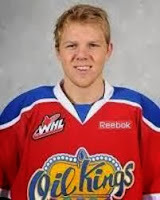 Friday night it was Griffin Reinhart (NYI 2012 1st) scoring his first goal of the season as part of his Edmonton Oil Kings' 4-0 white wash of the Red Deer Rebels." This one was a story of dominance as the Oil Kings just got better as this game wore on. The Oil Kings put up a game high 21 shots to seal the game during the 3rd period. Saturday night was a different story for Reinhart as the Edmonton Oil Kings faced Reinhart's kid brother Sam and New York Ranger prospect goalie Mackenzie Skapski (NYR 2013 6th) of the Kootenay Ice part of a Saturday/Sunday series. Griffin Reinhart set up what was the game tying goal in the 3rd period but Edmonton gave up a power play goal which gave Kootenay a 4-3 win in the first game of this mini series. The game's 3rd star Skapski got the start in net after sitting on Friday but despite giving up 3 goals on 31 shots, Skapski earned his 5th win of the season. Skapski improved to 5-3-1 with a 2.86 goals against and a 0.908 save percentage. Skapski is expected to also get the start Sunday afternoon. Cristoval Nieves (NYR 2012 2nd) was scoreless on Friday but had 2 assists on Saturday evening as his 5th ranked Michigan Wolverines had to settle for a 1-1 overtime tie on Friday and a 3-2 overtime win over 13th ranked New Hampshire. Nieves had a primary assist on Michigan's 1st goal on Saturday and then a secondary on Michigan's 2nd goal. Nieves needs to get more active on offense as he had 1 shot for the entire weekend and that simply doesn't move you up the depth charts or get you a 2nd invite by Team USA for the World Under-20 squad. Goalie Stephon Williams (NYI 2013 4th) was able to even his record to 2-2 after 2 really easy games against Connecticut as his Minnesota State Mavericks swept Connecticut 2-1 on Friday and then 6-1 on Saturday. Williams face only 16 shots on Friday and 13 on Saturday over a team that really is more power puff than NCAA Division 1. Ryan Pulock (NYI 2013 1st) scored his 4th goal of the season as his Brandon Wheat Kings knocked off the Medicine Hat Tigers 6-3. Pulock's goal was Brandon's 1st of the game and came on the power play. Pulock is now 4-5-9 on the season. Ryan Graves (NYR 2013 4th) was scoreless on 2 shots but recorded 3 hits as his Charlottetown Islanders defeated the Chicoutimi Saguenéens. The Islanders won their 3rd straight game and remain in 2nd place in the QMJHL with a record of 10-2-0-1. Kyle Burroughs (NYI 2013 7th) had an assist a game as his Regina Pats earned wins over the Medicine Hat Tigers (3-2 OT) and the Moose Jaw Warriors (4-2). The captain of the Pats had the primary assist on Regina's 1st goal against Medicine Hat and a secondary assist on their 2nd goal. Burroughs is now 0-11-11 as Regina has won 6 straight to improve to 7-5 on the season. Jesse Graham (NYI 2012 6th) saw his Niagara IceDogs earn a point in a 6-5 shootout loss to the Guelph Storm on Friday and a secondary assist during the IceDogs' 4-1 win over the Belleville Bulls on Saturday. The points improve Graham to 3-8-11 on the season. Adam Tambellini (NYR 2013 3rd) was scoreless this weekend as his 8th ranked North Dakota team handed Miami a rare home loss on Friday 4-2 but were spanked on Saturday 6-2. Tambellini at least on Friday evening just did not look good to me as he was caught up ice twice on Miami goals and just was not looking to make plays. He needs to use that size to his advantage at both ends of the ice. Victor Crus-Rydberg (NYI 2013 5th) had the secondary assist on the game winning goal as his Plymouth Whalers earned a 3-2 win over the Sudbury Wolves on Friday. Saturday, Crus-Rydberg was scoreless as the Barrie Colts defeated the Whalers 4-2. For Crus-Rydberg, the assist improved his stats to 2-6-8 on the season. Doyle Somerby (NYI 2012 5th) was scoreless in both games as his Boston University Terriers lost to RPI 3-1 on Friday. On Saturday, Boston University upset 2nd ranked Wisconsin 7-3. Somerby was 3rd pair defenseman. Goalie Eamon McAdam (NYI 2013 3rd) made his NCAA debut for Penn State as they took on the Air Force Academy on Friday. McAdam had a rough go of it dropping a 5-1 decision to the Air Force as he gave up 5 goals on 27 shots. McAdam was the backup on Saturday for Penn State.